It's getting that time of year again. 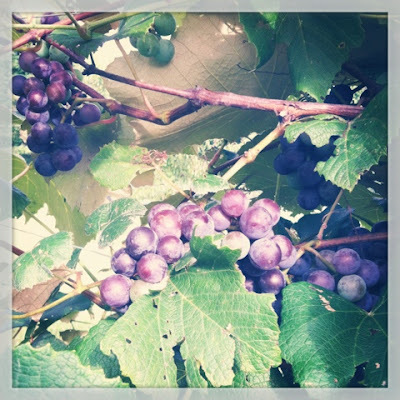 Our grapes are turning that gorgeous shade of purple and are about ready for harvesting. When yours are ready, here's all you need to do to make up a great batch of grape jelly with Pomona Pectin. Pour juice into a fine sieve bag and drip until all juice is extracted. Juice must set in refrigerator overnight. Prepare juice and add it to pan with lemon or lime juice. Measure sugar into separate bowl and mix with pectin. 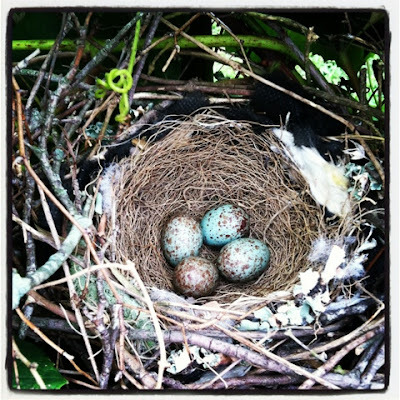 Our grapevines are not only housing grapes this year, but also some gorgeous baby bird eggs. Thankfully Moma bird is just caring for her eggs and not picking off our grapes. Wow you are so lucky to have your own grapes, I bet the grape Jelly is delicious, plum jam is the nearest I can manage in this climate!